Everyone thinks about spending time on the patio this time of year—we have all just survived another long Canadian winter and are itching for some outdoor time! Here in Brampton, there will soon be a push for new and replacement patio doors among homeowners and home builders. Naturally, our team at Brock Doors and Windows can’t wait to serve more people with their patio renovation projects throughout Brampton and the GTA! Whether you desire to upgrade your current patio or are building a new home and are in search of the right patio door to install, North Star patio doors through Brock have just what you need. North Star has been an industry leader in the manufacturing of high-quality, energy efficient, beautiful patio doors since 1985. This collection is known for its enhancement of beauty and value of the home. How? What makes North Star so unique? We’d love to show you! These doors are designed to hold the comfortable air indoors in and keep the fluctuating outdoor air out. And, while keeping you comfortable inside, you reap the benefits of an energy efficient patio door: lowered heat/air costs on your monthly bill! Regular Squares: allows for a classic look, divided by even squares. Prairie: achieves a picture frame look. Between the Glass (BTG): the grilles themselves are actually encased between the two panes of insulating glass, which leaves a smooth surface that’s easy to clean! Simulated Divided Lites (SDL): these look like traditionally divided grilles without the multiple pieces of glass (as in the “olden days”)—which means the outstanding energy efficiency is not compromised! SDL grilles are applied to the outer sides of the insulated glass for a more traditional profile. Have questions about our North Star patio doors? We would love to guide you around our showroom and let you see what a quality vinyl sliding patio doors in Brampton, Ontario can do for you. 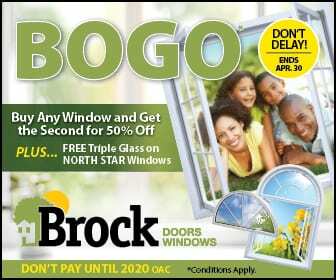 Your better home and patio with Brock Doors and Windows awaits!